I've recently started a sourdough starter culture (using equal parts water and spelt flour) and have used it in a sourdough bread recipe I got from the Telegraph. I've halved the recipe in the article so that I am using 500g Brad Flour, 150g Starter, 10g Salt. I don't think you're doing anything wrong, I think the dough is just more slack than you're used to. As @Jay noted, it can take some practice to work with a wet dough. But once you do, you'll be rewarded with a much more open crumb and a better final product. In my experience, I've found wetter dough and higher oven temps = better artisan bread (in general). The recipe appears to assume the reader is familiar with the process, but does offer some hints. She talks about scraping the dough out onto the work surface, then stretching-and-folding. 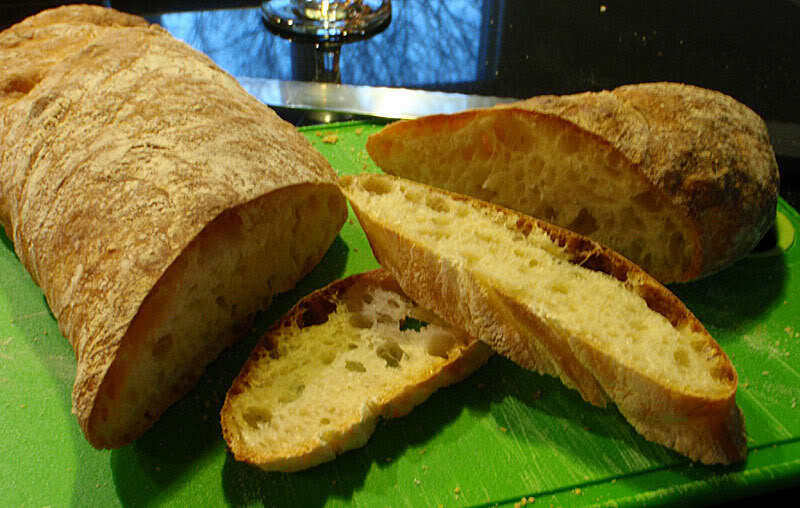 The recipe isn't as wet as the ciabatta I'm making below, but the process will be similar, so I hope this is helpful. I start by putting a bed of flour down, then scraping the blob of wet dough out onto it. Then comes the stretch-and-fold part, which is just as it sounds. Using a wet pastry scraper and/or wet hands, just get under one edge, lift and pull it away, then plop it back on top of the main dough blob. Then do the same with the other side. Cover with plastic wrap and walk away. There's no process of kneading like you're used to. This photo is after a few stretch-and-folds at 20-minute intervals (I think! ), and you can see the dough has started to smooth out and become cohesive. By the time you're ready to shape, the dough should be a lot more cohesive and easier to deal with. I folded mine into little slippers and put them on a couche to rise. Add 500 degrees and a baking stone, and I'm rewarded with an open and gelatinized crumb, and a nice crisp crust. Adding more flour is fine, up to a point, but the best bread is made from wet dough. 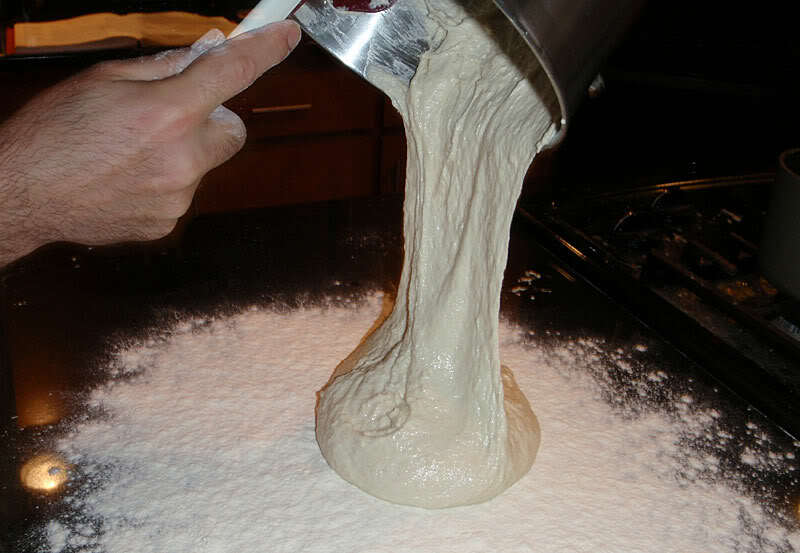 Put plenty of flour on your work surface to prevent the dough sticking to it, and more importantly, wet your hands repeatedly with cold water when you fold the dough - you will find it much easier to handle. I find using a dough cutter/scraper (also wet) makes things easier as well - you can get right underneath the dough with it. Giving the dough more time to rise will make no difference in its manageability. 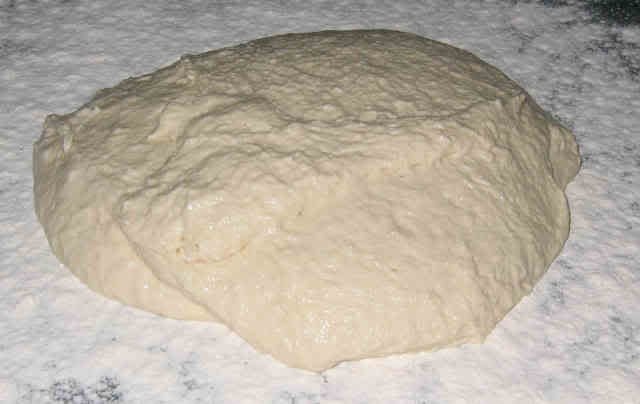 Instead of using more flour when handling the dough is to use oil. For wet doughs, I coat my hands and work surface with a little olive oil. 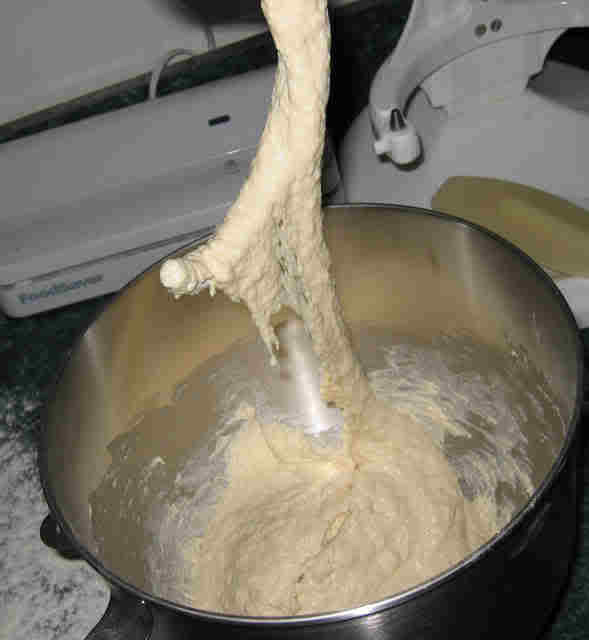 Any oil that does end up in the dough is not enough to alter the recipe and your dough stays moist. 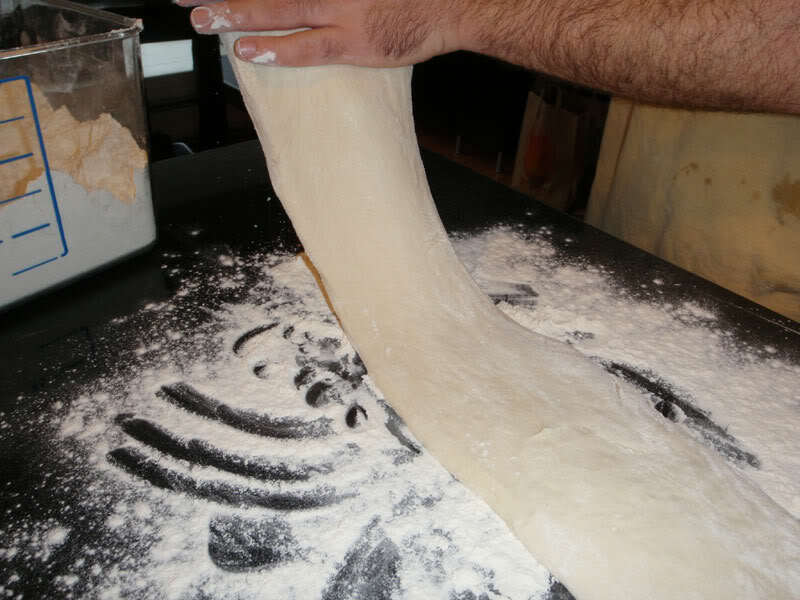 Be sure to only use a little oil, though, as too much will keep your dough from readily sticking to itself when using the technique you link to (stretch & fold) or when you shape it. With the starter, it comes out at about 65% hydration which means its really gonna depend on the brand and type of flour you use as to how slack or firm it is. With King Arthur All purpose or high quality bread flour, its probably firm enough to play with. With Gold Medal flour or regular AP or even a cheaper bread flour, its likely fairly slack. Luckily there's a few tricks to working with slack dough. Give it an autolyse. 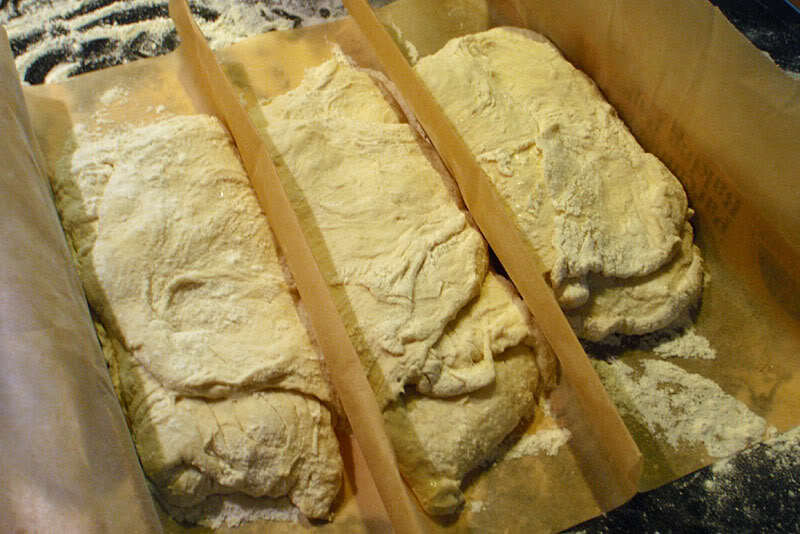 A short rest after the dough is mixed, but not kneaded, of 30 minutes will help the water absorb into the flour and result in an easier dough to handle. Chill it for a little bit. Chill the dough in the fridge for a bit, colder dough handles easier. Don't try a traditional kneading technique. Make sure and use the stretch and fold as the recipe suggests. Its much more suited to slack dough and works wonderfully. But it will be a sticky mess to start with. There are several methods to combat the stickiness. Namely, flour, cold water, and oil. I'm a fan of oil. I don't mind adding a bit to the bread as its kneaded and it makes the dough both slicker on your hands and more pliable by the end of the process. Just lightly oil your hands and the counter top. You just have to keep kneading it. After 10 to 15 minutes it will begin to develop gluten and will become a silky (but still tacky, sticky) ball. You test if it's ready by doing the window pane test. Looking at your ratios you don't need to keep adding flour. It will happily soak it up and then you'll end up with an extremely heavy dough. Just keep kneading it and let the dough tell you when it's ready. I thought that was ridiculous until I just kept kneading, and kneading, and kneading.... And then magic happened. It turned into a dough ball. It was awesome.